>This is not the typical mistake Monday – as there aren’t even any car seats in most of the pictures! The sad part is that these “mistakes” appear in real vehicles – and they make installation of car seats/boosters quite a challenge. Unfortunately, there were many more vehicles with humps & hinges I could have shown – I just selected a few for this post. Q: Why are hinges bad? A: In order to install a car seat properly, you need to sink it down and back into the vehicle’s seat cushion. Rigid structures – like metal hinges & the plastic covers for them – prevent the car seat from sinking into the seat cushion – leaving you with a loosely installed car seat (and an unsafe child). Is that a center seat – or just one big hinge with a little bit of fabric & cushioning? 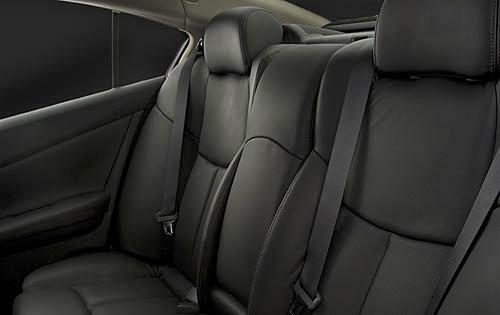 Check out how the seat belt for the center seat is several inches into the passenger seat – gotta love the overlapping! Are you kidding me? This is supposed to be a family car. Let me tell you why this center seat is a recipe for disaster for car seat installation. You have 5 inches from the buckle for the center seat to the buckle for the driver side seat. Have you seen a car seat that is 5 inches wide? I didn’t think so – as newborns are wider than 5 inches! You have not only 2 upper hinges, but also one lower hinge cover in this center seat – all to prevent you from getting the car seat tightly installed. The “lumbar bolster” (my name for it) – will further push the car seat away from the back of the vehicle seat. Q: The center seat in the back has a hump. Why are some humps bad? A: Humps can pose a challenge for several reasons. The foam under the center hump is often more rigid than the foam under the side seats’ cushion – which means that when you try to install the seat you have to use more muscle to compress the hump so that the car seat gets tight. Some humps are off center from where the LATCH system’s lower anchors or the vehicle’s seat belt is located. In this picture below, the vehicle has a hump in the center. The lower anchors for the side seat are half on the side and half into the center seat (we’ll explain later on this week why they spaced the lower anchors this way). With the car seat sitting half on the hump in the center and half off the hump, you end up with a car seat that looks drunk. While most humps are on the bottom cushion of the vehicle seat – some are on the back cushion, which further pushes the car seat forward and prevents it from sinking into the vehicle’s seat cushion. ← >Buying a car? Learn about these must-have safety features before you buy. >Thank you for the help. That was exactly what I needed to know. And, yes, she is rear facing (and will stay that way till she's 2!). I'll be using the LATCH system for now on. >Ssirsta – Great questions. I'm sorry you had such a scary incident. I am assuming your friend has a new Civic (or at least one that is 2002 or newer) – if this is the case, you have the lower anchors for the two side seats, and the top tethers for all 3 seating positions in the back. I can't tell from your post whether you installed a rear-facing or forward-facing seat, but judging from the problem you encountered I think it was likely rear-facing. What you found is that when you used the locking feature built into the seat belt to keep the car seat tight – the feature whereby when you pull the shoulder belt all the way out it locks as it goes back in – that as the seat belt got tighter it started to pull the car seat over on its side. This happens because the force is pulling up on the shoulder belt and it tips the car seat – so as the belt gets tighter, the car seat actually feels looser since it is tipping over. The solution is usually to use a metal locking clip to keep the seat belt tight – the locking clip keeps the seat belt tight just in the lap portion, so the baby's car seat doesn't tilt. However, the locking clip is a 2 person installation and a multi step process that is not the simplest thing to do. Therefore, it might be best to install the seat on the side using LATCH where you are more likely to get it tightly installed. There is no difference in the safety between the two side seats. If you have more questions, I would love to offer some more specific advice (which I can't do without knowing which car seat you were installing) – so feel free to email me at info@thecarseatlady.com – include your phone number and I'll call you back. >I'm glad you posted this as I had a scary incident this afternoon. My friend just got a new car and when we put my daughter's car seat in the middle for the first time, everything seemed alright. Once we started driving and we took a turn, her car seat started to slide around! We immediately pulled over in a nearby parking lot and put her on the side, using the LATCH system instead. But I am wondering if you could help me figure out a way to safely put her back in the middle. The car is a Civic Sedan with the shoulder strap type belt for the middle. It seemed like it had pulled the car seat up and made it unstable but I know I got it as tight as possible when installing it. Is it a problem with those types of seat belts? Do you happen to know if the LATCH system can be used on the middle seat since I didn't see the symbol anywhere but behind the driver's side seat? Also, if a car seat must be put on the side, would it be safer on the driver's side or passenger's side? >Abby – I am lucky in that parents come to me by appointment only – and I ask which car and car seat they will be bringing. If I foresee an installation issue, I discuss it with them ahead of time. These humps and hinges are typically only an issue for a center installation (and occasionally a side installation with LATCH – although usually not for a side installation with the seat belt). Usually it means that due to the contour of their vehicle seat the child must ride in an outboard position, instead of the center. We discuss that the center is 40% safer than the side and that perhaps we might be able to get a center installation with a different car seat than what they have. In my experience, there are several car seats that can best accommodate unfavorable vehicle seat conditions – the Graco Snug Ride 35 infant seat, and the Britax Marathon/Boulevard convertible seat. Some parents want to try anything to get the child to rid in the center – so they will bring along a new seat and if that works in the center we go with that, otherwise we stick to their old seat on the side. Others are OK with the baby riding on the side. I just like to help parents make an informed decision. >What do you do when someone brings you a carseat and asks you to put it into one of those cars? Do the best you can? Or tell them they can't drive that car safely with a child in it?